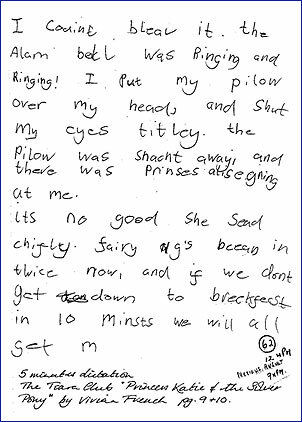 Rachel, aged 7, from London, found it very difficult to recall spelling whenever she wrote anything down on paper. She scored highly in her school spelling tests, but the same words were incorrectly spelt in her stories. These anomalies occurred because of slow processing difficulties. Most of her attention had to be placed on the recall of letters as well as the mechanical production of written language; very little attention could be placed on the production of the printed word and she was unable to develop a fully, automatic handwriting style. Rachel came to the Centre one year after her brother. She needed to develop an easier writing style, one that would become automatic and would allow her to pay more attention to the recall of written language. Sometimes the writing speed increases after the first week of practice, but usually, it can take about a month. A few students may take a year to develop an acceptable writing speed. However, there are some individuals who will never develop an average writing speed for their chronological age, but they are in the minority. For the few who will never write at speed, the advantages of developing a prescriptive handwriting style is that they can write accurately, with an easier handwriting style that does not develop into a painful performance (hand cramp). Illegible handwriting and hand cramp occur for both slow and fast writers. The effects of dysgraphia are responsible for many of the difficulties associated with under achievement in written English (known as Specific Learning Difficulties). They are: a sequencing difficulty (slow recall or poor recall of ideas, prefixes, root words, suffixes, paragraphs and punctuation), and sometimes, poor sentence construction. All these functional difficuties, collectively, inhibit the production and development of written language. They can be countered by the tutoring approach and methods used at the Learn-Write Centre. Distance is not a problem because so few visits are required. All the "Before" samples of handwriting that follow, can be compared to the "After" prescriptive styles. 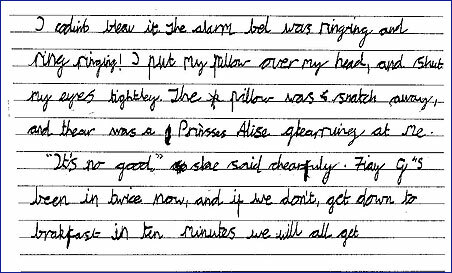 An improved 'After' handwriting style, and an improvement of written English, develops after one week of practice only, for students of all ages.